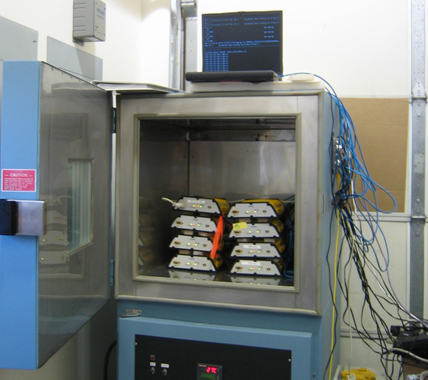 The UNAVCO Facility has begun testing all Trimble NetRS receivers in the newly acquired temperature chamber to ensure that all components meet the manufacturer environmental specifications. Currently, eight receivers can be tested at one time. A wireless network has been setup in the temperature testing lab to allow easy monitoring of each receiver while in the temperature chamber. An automated script queries the receivers every 10 minutes and returns information regarding the tracking, data recording status, and temperature of each receiver. Installation of the NetRS receiver has been halted temporarily due to a bad batch of compact flashcards supplied to Trimble by the card manufacturer. The UNAVCO Facility worked with Trimble engineers to quickly identify the problem by testing the receivers at 60 deg C and at -40 deg C. Procedures have been put in place at Trimble to rectify the situation as quickly as possible.